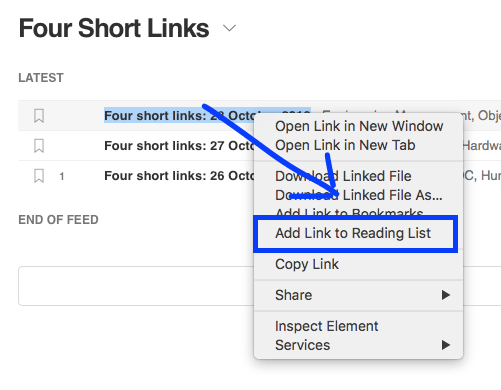 If you are a Safari user and spend a lot of time collecting links for later reading, this might be for you. I do a show called Unsupervised Learning every week (I pick my favorite stories in infosec and tech and talk about why they matter), and it’s important that I am able to efficiently collect content throughout the week so I can record on Sunday. There are a myriad of ways of doing this, obviously, but I prefer to stay in my native tools whenever possible. In this case that means Safari. MacOS has a shortcut in the right-click menu for “Add to Reading List”. For my purposes, I use it to capture links from applications and websites, such as Feedly, Tweetdeck, Reddit, Hacker News, and dozens of others—and send them to my Safari Reading List. Then, when it’s time to create the podcast, I simply open up my Reading List and start going through all the stories I’ve collected over the last week. This way, instead of going to my saved Reddit stories, Hacker News stories, Pocket, and a ton of others, I have most everything in Reading List. I works for me and I hope it helps someone else as well. On mobile I use Feedly’s “Save for Later” functionality or I force-click on the link, share, and send to my Reading List.